Mersenne Twister MT32 is a pseudo Random Number Generator (RNG) with a uniform distribution and a large prime period of 219937-1. The large period results in long pseudo-random sequences with no repetition. The Mersenne Twister described on this page is based on the MT19937 algorithm by Makoto Matsumoto and Takuji Nishimura. The MT19937 implementation requires no multiplications or division and hence simplifies FPGA implementation. 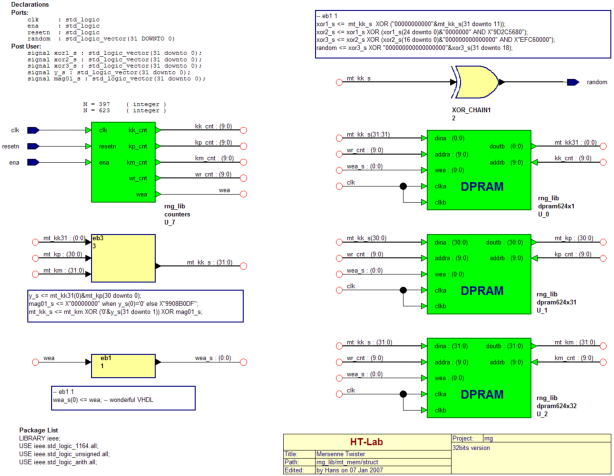 This page describes a 32bits version of the MT19937 algorithm implemented on a Xilinx FPGA. 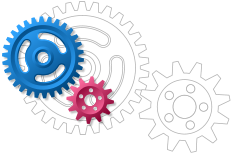 The generator is low on resources and can generate a new 32-bits sequence every clockcycle. The seed is pre-calculated as a memory image. The design is released under the GNU General Public License, for feedback, bug reports comments etc use the feedback form. • The original paper was published in the ACM Transactions on Modeling and Computer simulation: Mersenne Twister: A 623-Dimensionally Equidistributed Uniform Pseudo-Random Number Generator, ACM Transactions on Modeling and Computer Simulation, Vol. 8, No. 1, January 1998, pp. 3-30 • You can target other FPGA vendors by replacing the Dual Port Memory modules dpram624x?.vhd with generic versions. You also need to pre-load the memory with the contents of the dpram624*?.coe files. • The original source file mt19937ar.c was slightly modified to produce hex output values, see the mt19937ar.c file in the utils directory.